Ambassador S. Jaishankar will speak at Emory Nov. 19. Photo courtesy of the Embassy of India. Indian Ambassador to the United States S. Jaishankar will deliver a public talk, “India and the U.S.: Taking the Relationship Forward,” on Wednesday, Nov. 19 at Emory University. Jaishankar will discuss U.S.-India relations following Indian Prime Minister Narendra Modi’s recent visit to Washington. Modi was sworn in as prime minister in May after the biggest general election victory for a single party in India since 1984. Hosted by Emory’s Halle Institute for Global Learning, the event takes place at 4:00 p.m. at the Emory Conference Center Hotel’s Silverbell Pavilion, 1615 Clifton Rd. A question-and-answer session and reception will follow. Admission to the event is free, but guests should register online to attend. 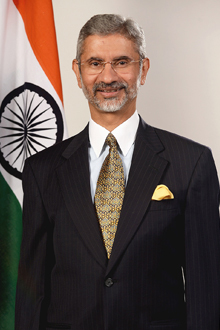 Jaishankar became Ambassador of India to the United States in December 2013. He arrived in Washington from Beijing, where he served as Ambassador of India to China from 2009 to 2013. Previously, he was High Commissioner to Singapore. He first joined the Indian Foreign Service in 1977 and has held posts in Moscow, Budapest, Prague and Tokyo, among others.